These are great because they're way easier than a deep-fried blooming onion, and also a smidge or two healthier. 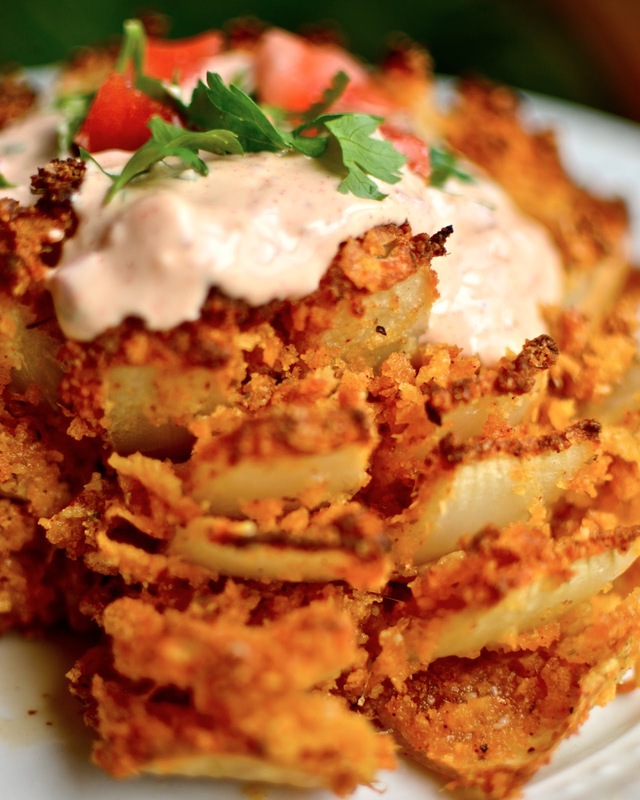 To make your blooming onion, you will start with the obvious. An onion. I was looking for a big sweet onion like a Vidalia, but I couldn't find one. This is a yellow onion and it worked fine. First slice off the top. In case you are as easily disoriented as myself, this is the end opposite the roots. Peel off all that skin and then flip him over. Carefully slice off some of those roots with a sharp knife. 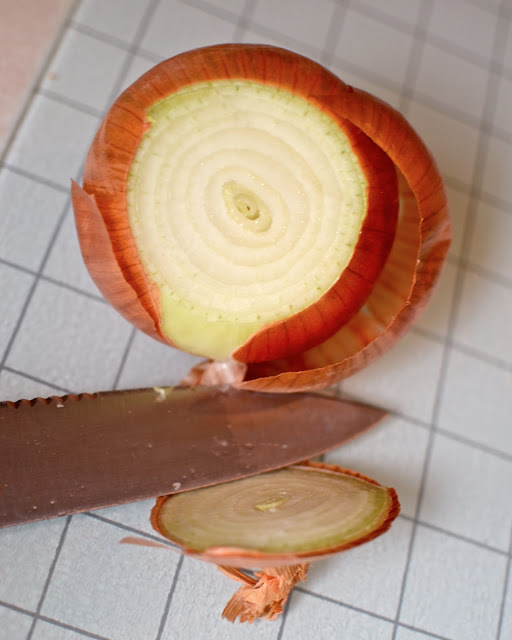 That way your onion can stand up easier without rolling over which makes it easier to slice it into wedges. Just make sure you don't slice all the way through. Then you'll just have a bunch of onion pieces instead of a big beautiful onion flower. Now drench it in some eggs and stuff. Make sure you get in between all the petals. Next is the crumb coating. You'll have some crushed corn chex or gluten free cornflakes , some seasonings, and to bind it all together you can either use Parmesan cheese or corn starch if you're trying to do dairy free. Thankfully Parmesan doesn't bother me, but the corn starch works great too. After it gets a good coating, make sure you give it one more dunk in the eggs and then a final coat in the crumbs. That's TWO coats of crumbs people. Very important. Now drizzle it in some butter or oil. Again, depending on whether or not you're eating dairy. Both work great. You don't want any dry, white crumbs showing, so if you didn't manage to get it by drizzling, give it a little spritz of cooking spray. After it comes out of the oven, the rest is history. In one bowl, beat together the eggs, water, paprika, garlic powder, and mustard. In another bowl mix together the cornflakes, parmesan or corn starch, garlic powder, paprika, oregano, cayenne, salt, and pepper. Set aside. Cut about 1/2 inch off the top of the onion and peel the skin off. 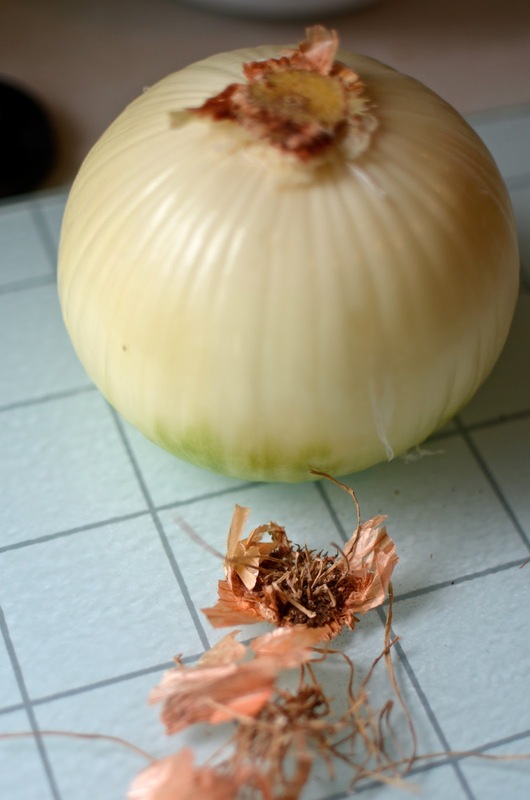 Cut the tip of the root off so the onion can stand on it. Cut the onion into about eight wedges being very careful not to cut all the way through (leave about 1/2 inch). Dip the onion in the egg mixture, spooning it between each "petal". Once it's completely coated toss it in the crumbs, once again spooning it between each petal. Repeat this process, coating the onion once more in the egg mixture and then a final time again in the crumbs (use every bit of the crumbs you can). Place on a well greased baking sheet. Drizzle with melted butter and/or oil. Then you can give it a final spritz of cooking spray (PAM or something) to make sure the whole thing is coated. Bake at 425ºF for about 45 minutes. Serve with remoulade. Don't forget to follow on Facebook, Twitter, Pinterest, and Spotify!